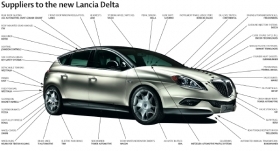 Lancia unveiled the new Delta at the 2008 Geneva auto show. The latest generation model follows on from its predecessor after an interval of more than a decade. Previous versions were manufactured from 1979 to 1994, with a total production of more than 480,000 units. The new Delta will be made available with a choice of five gasoline or diesel engine variants and three trim levels. The Delta's headlights and taillights are produced by Magneti Marelli Automotive Lighting. The headlamps come with either halogen or xenon bulbs, of which the latter automatically rotates in response to cornering information passed from the steering system. Both types of headlamps are fitted with LEDs in addition to the main bulbs. Magneti Marelli also equips the Lancia with its daytime running lights, which turn on automatically when the engine is started. The Italian supplier also provides the front fog lights, which are equipped with another cornering function. Johnson Controls Inc. contributes the lighting for the floor console, which illuminates the area surrounding the gear shifter. A light guide made of transparent polyurethane reflects the color from the LED allowing custom, gentle illumination. Natural light enters through Webasto AG's large panoramic “Granluce” sunroof, which has a 0.7 square meter glazed area. Saint-Gobain Sekurit provides the glazing for the windshield, side windows and rear window. Many suppliers improve the vehicle's safety. TRW Automotive Inc. supplies the automobile with a lane departure warning system called Driver Advisor. The system, which activates at speeds of between 65 and 180kph (40 to 112 mph), comprises a camera with image-processing software and a control unit to predict whether the vehicle is about to depart from its lane. In such an event, torque slightly opposing the car's crossing of the lane is transmitted to the steering wheel. The American supplier also provides the Delta's electronic stability control and electrically powered steering systems. The vehicle also has an electronic variable damping suspension system from Magneti Marelli. This so-called "Reactive Suspension” uses sensors to monitor driving conditions and then adjusts the suspension accordingly. Fast processing times of the electronic control unit and almost instantaneous response of the system's solenoids minimizes vibration from uneven roads. Furthermore, the system reduces braking distance by approximately 5 percent by virtue of improved road-wheel contact. The introduction of this suspension system was significant, indicating that the Fiat S.p.A.'s view this technology as now appropriate for vehicles outside the premium segment. Lancia and Magneti Marelli are subsidiaries of Fiat S.p.A. The interior feel of the vehicle is augmented by soft-trim materials from Benecke-Kaliko. The German supplier provides its Benova polyurethane soft trim for the Lancia instrument panel. This leather-like material has traditionally been used in high-end cars from Lancia sister brand Maserati.